My good friend Doug Tieman, CEO of Caron Treatment Centers, was in town recently to give a talk on the opioid epidemic. Information about treatment for drug abuse can be found at Caron's website, and here is an excerpt from their well-written information section. Repeated drug and alcohol use causes chemical dependency, or lasting changes to the way the brain functions and operates. In fact, all abused substances alter the areas of the brain responsible for self-control, judgment, emotional regulation, motivation, memory and learning by hijacking the brain’s normal reward pathways. Although abused substances—including alcohol, heroin, benzodiazepines, methamphetamine, nicotine and prescription drugs—act on different pathways in the brain, they all necessitate increasingly higher doses to produce a high or simply allow the user to feel normal. Issues such as mental illness, multiple addictions and ancillary health problems may complicate substance addiction. Addiction as a Disease [video] See and hear Doug Tieman on YouTube. Why do people use alcohol and drugs? Stress: Substance abuse may be a means to escape problems or a way to reduce stress. The role of stress in beginning drug use, continuing drug abuse, or relapse in recovering patients should be addressed and approached holistically. Psychological triggers: People suffering from anxiety disorders, trauma, depression or other psychological illnesses may begin using alcohol and drugs to reduce or numb personal distress. Individuals with alcohol or drug dependence are nearly twice as likely to have a co-occurring psychological disorder. When does alcohol and drug become substance addiction? Substance use becomes abuse and later addiction when the drugs or alcohol begin to take control over one’s life. For many substance addicts, this is the tipping point: seeking and using increasing amounts of drugs, despite the tremendous problems it causes for themselves and their families. Individualized addiction treatment can help. Though substance abuse and addiction affects millions every year, no two people experience addiction the same way. People suffer from substance abuse and addiction for a variety of reasons and usually face related challenges, such as life stressors, emotional burdens and psychological issues. Although the prospect of overcoming substance addiction may seem impossible, recovery is within reach for all addicted persons. Federal health officials have called for doctors to stop prescribing chronic pain patients so many of the drugs. The alert has been highlighted by Buzzfeed.com. Statistics suggest that 1 out of every 150 patients prescribed long-term opioid painkillers die of a condition related to their prescription within three years of its start. Opioid painkillers such as OxyContin and Vicodin are now prescribed to as much as 4% of the U.S. population — 250 million prescriptions — with their use quadrupling since 1999. Some 1.9 million Americans are now addicted to, or dependent on, the painkillers. And from 1999 to 2014, about 165,000 people died of overdoses. Almost all of the opiate-related drugs on the market for pain are as addictive as heroin. According to the National Institute on Drug Abuse (NIDA), the abuse of and addiction to opioids such as heroin, morphine, and prescription pain relievers is a serious global problem that affects the health, social, and economic welfare of all societies. It is estimated that between 26.4 million and 36 million people abuse opioids worldwide, with an estimated 2.1 million people in the United States suffering from substance use disorders related to prescription opioid pain relievers in 2012 and an estimated 467,000 addicted to heroin. The consequences of this abuse have been devastating and are on the rise. For example, the number of unintentional overdose deaths from prescription pain relievers has soared in the United States, more than quadrupling since 1999. 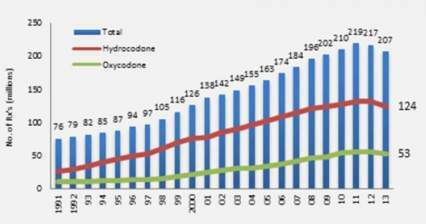 There is also growing evidence to suggest a relationship between increased non-medical use of opioid analgesics and heroin abuse in the United States. Opioid medications can produce a sense of well-being and pleasure because these drugs affect brain regions involved in reward. People who abuse opioids may seek to intensify their experience by taking the drug in ways other than those prescribed. For example, extended-release oxycodone is designed to release slowly and steadily into the bloodstream after being taken orally in a pill; this minimizes the euphoric effects. People who abuse pills may crush them to snort or inject which not only increases the euphoria but also increases the risk for serious medical complications, such as respiratory arrest, coma, and addiction. When people tamper with long-acting or extended-release medicines, which typically contain higher doses because they are intended for release over long periods, the results can be particularly dangerous, as all of the medicine can be released at one time. Tampering with extended release and using by nasal, smoked, or intravenous routes produces risk both from the higher dose and from the quicker onset. The Centers for Disease Control released a dozen opioid prescription guidelines in the Journal of the American Medical Association (JAMA). They will not have the power of law but will guide insurance company recommendations to doctors and Veterans Administration prescriptions for retired military patients, with the aim of curbing dangerous prescribing practices. "Primary care clinicians find managing chronic pain challenging," according to JAMA, and "evidence of long-term efficacy of opioids for chronic pain is limited. Opioid use is associated with serious risks, including opioid use disorder and overdose." The guidelines are based on three principles. First, opioids should be a last option for these patients, with aspirin-related drugs and exercise preferred. Second, when given, doses should start out low and only increase slowly. Third, patients should be monitored and a plan for getting them off the drugs should start with their prescription. The guidelines also call for getting naloxone, a drug used to counteract overdoses, into the hands of more doctors, nurses, police, and emergency personnel. In 2012, physicians wrote 259 million prescriptions for pain killers, enough to give a bottle of pills to every adult in the USA, Frieden said. More than 2 million Americans abuse prescription opiates, according to the National Institute on Drug Abuse. About 669,000 use heroin, to which many opiate users turn when they can no longer afford pain killers. With nearly 44,000 deaths a year, more Americans today die from drug overdoses than from car accidents or any other type of injury. Many of these deaths could be prevented if patients had better access to substance abuse therapy, experts say. Yet people battling addiction say that treatment often is unavailable or unaffordable. Only 11% of the 22.7 million Americans who needed drug or alcohol treatment in 2013 actually got it, according to the Substance Abuse and Mental Health Services Administration. While some of those who went without care did so by choice, at least 316,000 tried and failed to get treatment. "We know addiction treatment saves lives, reduces drug use, reduces criminal activity and improves employment," says Paul Samuels, president and director of the Legal Action Center, which advocates on behalf of people with HIV or addiction. "The data is there, the evidence is in, but our public policy has not caught up with the science." Meanwhile, the crisis is getting worse, says Thomas Frieden, director of the Centers for Disease Control and Prevention. The death rate from drug overdoses more than doubled from 1999 to 2013, according to the CDC. The bulk of these deaths involve opiates, a class of pain killers that includes morphine and Oxycontin. Injection drug use has fueled an outbreak of HIV in rural Indiana, a nationwide surge in hepatitis C infections, and an increase in the number of babies born addicted to drugs. States have responded to the surge in overdose deaths by expanding access to naloxone, a fast-acting rescue drug that can reverse the effects of an opiate overdose. Indiana lawmakers also voted to allow needle exchange programs in communities facing a public health crisis related to injection drug use. While those approaches are welcome, they don't treat the underlying addiction. The wait for a spot in a detoxification program ranges from days to weeks, and it can be very expensive. As I say elsewhere here on my site, it's also true that not all treatment is really good treatment. Consumers are disadvantaged twice. Not only is treatment hard to find in the first place, but it's hard to know what constitutes a good treatment program. I have some comments about this on my FAQ page and on my Philosophy page.